WASHINGTON (Reuters) - The trial to determine if the U.S. Department of Justice can stop AT&T Inc's $85 billion purchase of media company Time Warner Inc will begin on March 19 with no decision expected before the companies' April 22 deadline to complete the deal, a federal judge said on Thursday. Judge Richard Leon said during a hearing on Thursday he would likely not have a decision by the deadline in the companies' merger agreement, but would rule in late April or May. The trial date is almost midway between the Feb. 20 date AT&T had requested and the U.S. government's preferred date of May 7. In a statement, AT&T’s General Counsel David McAtee thanked the court for its "expeditious approach" to the schedule. "We will promptly discuss the Court’s post-trial schedule with Time Warner," he said. "We are committed to this transaction and look forward to presenting our case in March." The fate of the deal has been widely followed because U.S. President Donald Trump criticized it on the campaign trail last year and has repeatedly attacked the reporting of Time Warner's CNN news network. "I think your pricing's going to go up, I don't think it's a good deal for the country," he said in November. It is not clear that Trump's comments will have an effect on the trial. "I don’t think it is a great idea to get into all of this (allegations of White House interference) because every deal raises different facts," said Andre Barlow of Doyle, Barlow & Mazard PLLC. "The court is going to decide this case based on the economic realities of the video distribution and content markets and not on President Trump’s public battle with CNN." 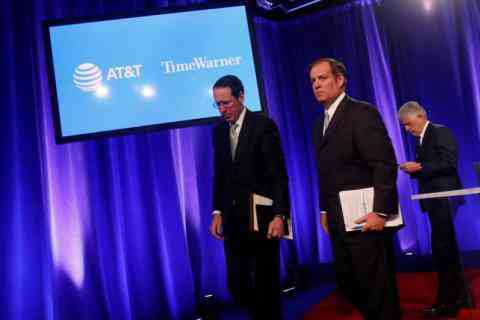 AT&T and Time Warner said in a court filing that Time Warner's Turner Broadcasting unit had offered its distributors licensing terms that forbid Turner from "going dark" for seven years after the deal closes if they reach an impasse in negotiations. Blackouts are a negotiating tool in carriage disputes between distributors and programmers.